Dave recently underwent a bid change which means that for the next two years he will have a new crew (that he got in the bid) and new station. This crew and station will stick for the next two years. 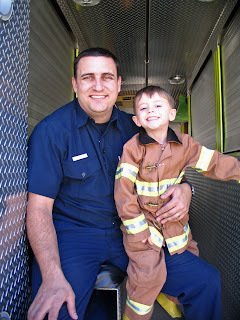 Since I have been off, and seriously tired as Caiden has LOADS of energy and is awake during the day, and Kiya is awake during the night, Dave thought it might be a good idea for us to come down to see his new fire station. This way, he could help me burn off some of the endless amounts of energy that Caiden seems to have, and I can get a bit of a break. 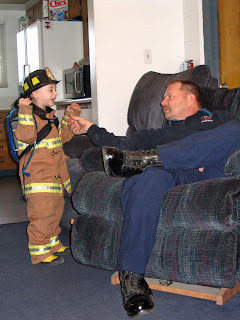 Of course when I told Caiden of course he was thrilled as he loves going to see daddy at the fire station, and he promptly got into his fire gear. I loaded everyone up in the car and off we went. 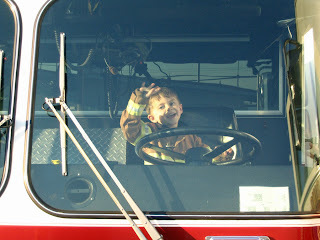 Dave's new fire station is nice, and his crew is even nicer. They were very gracious and let us spend a few hours there. Dave showed us some of the new toys they got. It was pretty cool. 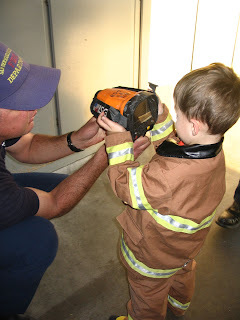 They got something that senses where people are if they are under rubble, and then they have a heat sensor camera (of course they are not the real names for it. They are the names that I am giving them). 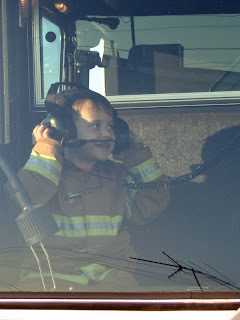 Cade had a great time playing on the rigs and checking out the new station, equipment and chatting with the crew. BOY DID HE CHAT! They were great conversationalists and were wonderful with Caiden - even when he followed the captain around asking questions :P He is a talker after all. 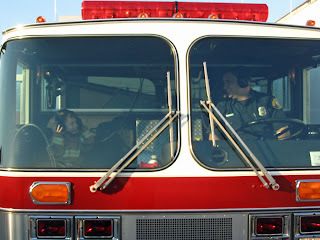 Caiden chatting up a storm with the Captain. 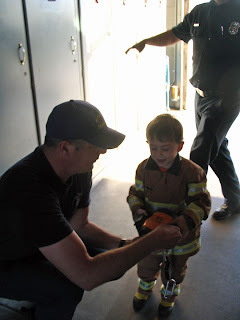 Caiden testing it out - the captain had placed his hand on the lockers and Caiden was looking at the heat left over from the hand print. Sounds like Davids new station is cool!! Search and rescue...HOW EXCITING!! I am so glad that David is with a nice crew again. Work is so much better when you like the people you work with. That is very cool. Looks like fun.